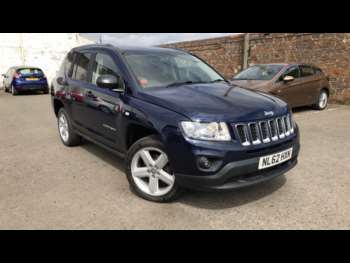 Launched in 2007, the Compass was Jeep's first venture into the 'soft roader' market – four-wheel drive vehicles that are intended mainly for on-road use. The compass has a 2.0-litre diesel with a six-speed gearbox or a 2.4-litre petrol with a choice of five-speed manual or CVT automatic. A second-generation model launched in 2011 following Fiat's takeover of the Jeep brand. Two-wheel drive versions were available in the UK for the first time. A 2.0-litre petrol engine was added to the range and the diesel was replaced by a 2.2-litre Mercedes unit with a six-speed box. First-generation Jeep Compass cars were only available in Limited trim with 18-inch alloy wheels, leather trim and climate control. But entry-level Sport versions were added to the later model on 17-inch rims with cloth seats and manual air con. There was also a limited edition 70th Anniversary model in April 2011. From the front, a used Compass couldn't be anything other than a Jeep but it's smaller than you might think – in length and width. Later models have six air bags, stability control and the ERM system that helps to prevent a roll over. There's also an immobiliser and a Thatcham category 1 alarm system. The interior, particularly on second generation cars, feels classy with the gear lever and minor controls falling nicely to hand. The back seat splits 60:40, and you can fold the front passenger seat flat too which is handy for carrying large loads. You'll be spending most of your time on the road and the Jeep Compass offers a high driving position and a decent balance between ride comfort and body roll. The power steering is a bit vague, so you won't want to hustle it too much, but it goes where it's pointed. If you're trading up from an ordinary hatchback you won't need too much adjustment. The Jeep heritage hasn't been totally abandoned, and the four-wheel drive models are more competent in the rough stuff than you might expect. However, it's also a competent and well-equipped road car.